Designed for the flooring professional who demands top performance at the jobsite, choose from floor strippers, scrapers, pry bars, knee pads and more for most any flooring project. Crain tools are built tough to provide long-lasting durability under the toughest conditions. Floor Stripper (#350) - Durable hand stripper has a 12" long handle with a zinc alloy head and blade clamp for improved performance. The oversized vinyl grip has a rounded knob to fit comfortably in your palm, while the blade clamp is fastened with 3 case hardened slotted head screws for extra strength. Comes with one .020" thick replaceable floor stripper blade ideal for fine floor prep work such as adhesive removal. Pro Stripper (#360) - With its 20" handle, the Pro Stripper allows for two-handed operation and greater reach for hard to get at areas. The scraper head and blade clamp is made from a zinc alloy for extra durability and the oversized vinyl grip has a rounded knob to fit comfortably in your palm, while the blade clamp is fastened with 3 case hardened slotted head screws for extra strength. Comes with one .020" thick replaceable floor stripper blade designed for fine floor prep work such as removing adhesive residue. Big Scraper (#375) - Designed for when heavier, more aggressive removal work needs to be done, this stand-up scraper features a telescoping tubular handle that adjusts from 39" to 59" using a simple twist-lock mechanism. For enhanced durability, the scraper head is steel-reinforced while the blade clamp is fastened to the head using 4 case hardened slotted head screws. Comes with one 8" replaceable heavy-duty .037" thick scraper blade, and a blade cover for storage. Inertial Scraper (#390) - With its metal knob handle, the Inertial Scraper can be hammered with a rubber mallet to scrape and remove stubborn spots left on the floor. The rounded edges on the knob fit comfortably in the palm, and the 18" handle allows for working with both hands while providing extra reach. Comes with a replaceable 5" wide blade in the same .037" thickness utilized in the heavy-duty Big Scraper. Scraping head is steel-reinforced and the blade clamp is fastened to the head with 3 case hardened slotted head screws. Cushion Stair Tool (#152B) - Designed to be used with a mallet, the 4" wide Stair Tool is used to tuck carpet into the corner of stair treads, as well as to tuck carpet at the wall between the base board and the tackless strip. It features a textured, soft cushion grip that absorbs vibration, and the blade''s outer edges are angled back to form an offset to protect walls and allows the corner of the tool to get deep into an inside corner area. With its smooth tapered design, the blade will not snag or cut the carpet. 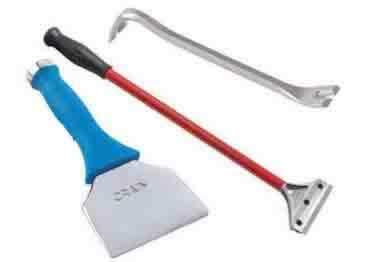 Molding Lifter (#157) - Made from forged, hardened steel the Molding Lifter steel pry bar is ideal to get behind wood wall base, moldings and trim and pry it off walls with a minimum amount of damage. Nickel plated, the pry bar's rocker and flat ends have slim, wide-profile prying surfaces that are polished smooth for improved usage. Each end has sharp, beveled nail slots designed for taking up small headed nails, brads, and staples that are often used for installing base and moldings. "Comfort Knees" Knee Pads (#197) - Designed especially for carpet installation, Comfort Knees offer protection when kneeling or knee kicking while installing carpeting. Featuring extra wide straps to keep from pinching legs, even when wearing shorts, they''re contoured to conform to the motion of the knee when walking, kneeling, or kicking. Machine washable, Comfort Knees are made from flexible, durable neoprene, and the inner knee pad is replaceable. Built to last for most any project under the toughest conditions, Crain flooring tools are designed for the flooring professional who demands top performance at the jobsite.